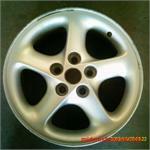 2068b, Used Rims, 16X6-1/2, 5 LUG, 100mm, 96-00, CHRYSLER, SEBRING, 10 SPOKE, WHITE, ALLOY. 3299b, USED RIM, 15X6, 4 LUG, 4-1/4", 98-00, FORD, CONTOUR, SILVER 6 SPOKE, WITH NO SPARKLE. 3445b, Used Rims, 17X7-1/2, 5 LUG, 108MM, 00-01, LINCOLN, LS, 5 SPOKE PAINTED FLAT SILVER, DIMPLE IN CENTER OF SPOKE, ALUM. 5080, Used Rims 16X7, 6 lug, 5-1/2", 99-04, GMC, VAN, SIERRA 1500, YUKON, YUKON XL, OPT PF9, 6 ROUNDED SPOKES, SILVER PAINTED, ALLOY. 58707, Used Rims, 16X7, 5 LUG, 112MM, 95-04, AUDI, A4, A6, ALLROAD, S6, 45mm OFFSET, 5 STRAIGHT SPOKES. SILVER, ALLOY. 62396, Used Rims, 16X6-1/2, 5 LUG, 4-1/2", 02-04, NISSAN, ALTIMA, ALLOY, PAINTED SILVER, 6 SPOKE. 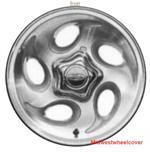 6518b, Used Rims, 15x6, 5 LUG, 100 MM, '96-'99, PONTIAC, SUNFIRE, PAINTED OUTER EDGE, PAINTED SILVER, 5 SPOKE, ALLOY. 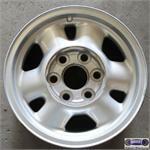 6518b, Used Rims, 15x6, 5 LUG, 100 MM, 96-99, PONTIAC, SUNFIRE, PAINTED OUTER EDGE, PAINTED SILVER, 5 SPOKE, ALLOY. 6522a, Used Rims, 16X6, 5 LUG, 100MM, 96-98 PONTIAC, GRAND AM, 3 SPOKE. SILVER, B= WHITE. 6522a, Used Rims, 16X6, 5 LUG, 100MM, 96-98 PONTIAC, GRAND AM, 3 SPOKE. SILVER, A=SILVER B= WHITE. 65772a, Used Rims, 17X6-1/2", 5 LUG, 4-1/2", 00-02, MITSUBISHI, ECLIPSE. SILVER FINISH ALUM 6 SPOKE. 65772a, Used Rims, 17X6-1/2", 5 LUG, 4-1/2", 00-02, MITSUBISHI, ECLIPSE. SILVER FINISH ALUM 6 SPOKE. A=SILVER B=CHROME. 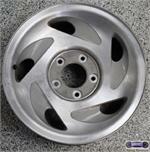 66004, 14" USED HUBCAP, '98-'01, KIA, SEPHIA. SILVER, 5 TEAR DROPS, 4 HOLE, HELD ON BY LUG NUTS, 5 ANTI RATTLING CLIPS. 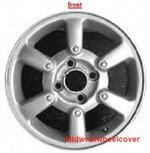 66004, HUBCAP USED, 14", 98-01, KIA, SEPHIA. SILVER 5 TEAR DROP, 4 HOLE HELD ON BY LUG NUTS, 5 ANTI RATTLING CLIPS.